It dawned on me today that there is something I had not discussed here. For anybody who is new to building guitars (as I was two years ago), there is something important to note – the benefits of using handplanes over sanding. When I started this blog, I intended it to be a one-stop resource for those new to woodworking and/or lutherie. So it’s important then for me to note for the beginner why handplanes are important. Handplanes are enjoyable to use – but aside from making nice thin curly shavings, the real reason for handplaning is this: the finish that you can achieve with a handplane is much better than what you can achieve by sanding. This is something that is talked about a lot – however, there are not a lot of images online when you research hand planing that demonstrates what the actual difference is in the wood’s appearance. I was testing out a smooth plane today (the African Blackwood smoother from the handplane making tutorial actually) and I snapped a photo of the piece I was working on – which happened to be piece of highly figured curly maple. 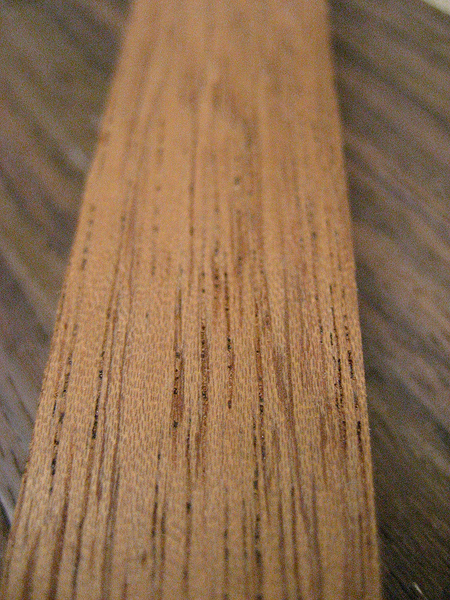 The right side of this piece of wood has been planed with the smooth plane – the left side has been sanded to a reasonably high grit. Look at how much more prominent the figure is on the side that was planed! This will be reflected in the wood under a finish as well (in fact the difference will probably be multiplied), and using a handplane will make your figured wood considerably more attractive. Now, unfortunately, I didn’t take a lot of photos for this part – however I will describe what I’ve done with the few photos I do have. First off – this is not the same plane as before. This is another plane that I’m working on. I haven’t had a chance to finish up the ebony plane yet, but I did finish this one today – so I took photos of this one instead. The process is the same either way. When we left off last time, the plane was just assembled and buffed. The mouth of the plane should be too tight for your plane iron at this stage (i.e. the blade should not fit through the mouth yet). Next up is to profile the plane into the shape you want. You can figure out your own design, but this is how I profile my wooden hand planes. To start off, the back edge of the plane is rounded over. Next up, I mark off lines around the edges at all four corners. This is about the height of a pencil off the bottom edge. I use a silver pilot pen because it shows up well on dark woods like Ebony (or in this case, African Blackwood). This is the part I didn’t take any photos of – the chamfers. I just do these on the router table using a 45 degree chamfer bit. You can also do this by hand with a file however. Actually, what works even better than a file (way better!) is a micro-plane zester – just don’t let the wife see you sneaking it out of the kitchen. I use it to carve guitar necks when nobody is looking. Notice below – the chamfers are cut only up to the lines drawn on the corners before. Another thing to note is that you need to be careful when chamfering the top edges. There is nothing for the bearing to ride on when you chamfer around the mouth – so you need to leave that part, and clean it up with a file, zester, or belt sander (careful if you use the belt sander, it’s easy to take off too much material in a hurry). On this particular plane, I then polished it up by sanding to 220 grit and throwing it on the buffing wheel. The last step is to make a wedge or lever cap – this plane will ultimately get a lever cap, but I made up a quick wedge just for doing the test cuts. To make the wedge you just need a piece of wood the same width as the iron, which is flat on the back. The top can be profiled as you wish – there are lots of examples of wedges to be found online. The final step is to open the mouth of your plane so that it will accept the blade. The width of the mouth depends what you are using the plane for. The distance between the edge of the mouth and the cutting edge should be 0.5 mm for a general plane. If you want to make a smooth plane like this one, 0.2-0.3 mm is better. 0.8-1.0 mm is fine for smaller planes such as curved or flat bottomed luthier’s planes. To open the mouth, very careful use a chisel or a small file. Make sure to keep the edge straight, and check the mouth size often as you work. I usually use a chisel. This is the one I used to fit the mouth on this blackwood plane (an EA Berg 1/2″ Eskilstuna that I very recently discovered). If you use a chisel, be sure that it is shaving sharp – sharp tools make the job much easier and make your work more careful and accurate. Test cuts – this plane will cut better once it has a lever cap, but the quick wedge worked alright. This is how your plane should cut – thin shavings on very hard woods (the ebony here is very hard, and dense enough that it does not float in water). 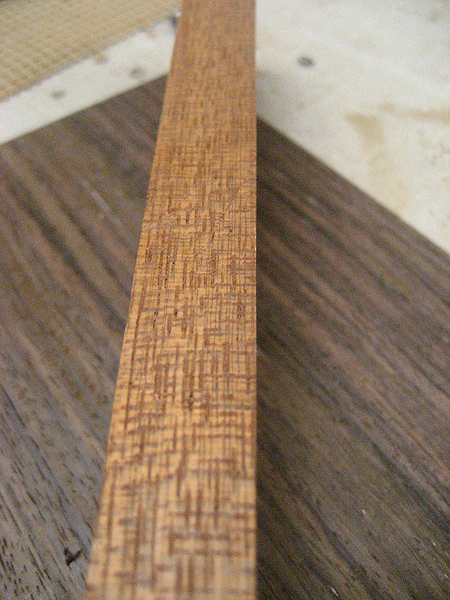 The second test cut was on Oak. Having a very tight mouth on the smooth plane will help to reduce tearout – if the mouth is too wide, it will be difficult to plane woods with alternating or unpredictable grain (like Curly Maple). When I have the lever cap for this plane, I will post some test cuts on some highly figured maple. And that is the end of the Krenov tutorial! If there’s anything that I have not been clear on, feel free to leave a comment and I’d be more than happy to give more detail on anything.